The International Astronomical Union (IAU), met in 2006 at Praha, Czech Republic, where it reclassified Pluto as a minor planet. However, the majority of the astronomical community did not attend that discussion, and many members disagree with its results.The attempt to degrade Pluto from planet status was strongly supported by Michael E. Brown, especially after his team at CALTEC discovered Eris and other TNOs (Trans Neptunian Objects) with masses similar to Pluto's. I myself preserve the thinking of Clyde Tombaugh, who discovered Pluto on 18 February 1930, assuming it to be the long sought Planet X.
Pluto-like (outermost, trans-Neptunian) planets consisting mainly of nitrogen, carbon monoxide and methan ices and rocks, probably (alumino)silicates. Similarly as Jupiter-like planets are gas giants, the Pluto-like planets are small ice planets. Pluto does not need to be removed from the class of planets and that before we know anything about the Kuiper's belt space (beyond 30 AU, but mainly around 100 AU from the Sun). The term planet had long been used for something moving around some other thing, such as in a planetary gearbox (drawing on the left). This concept has also been applied in astronomy for relatively cool cosmic bodies without own visible light orbiting around stars, which produce enough visible light to cast it onto the planets circling them and make them visible. In the Solar System, Pluto, on its eccentric and tilted to ecliptic orbit, changes its temperature from 60 to 40 Kelvin and also shows marked changes in atmospheric pressure (for further data, see https://en.wikipedia.org/wiki/Pluto#Internal_structure ). The unique NASA space exploration, New Horizons, headed by Principal Investigator S. Alan Stern (photo on the left), is now culminating: the spacecraft safely passed the Pluto area on July 14. If you wish to see WHERE IS NEW HORIZONS NOW - cklick on the hyperlink . NASA's New Horizons mission is returning to normal science operations after a July 4 anomaly and remains on track for its July 14 flyby of Pluto. The investigation into the anomaly that caused New Horizons to enter "safe mode" on July 4 has concluded that no hardware or software fault occurred on the spacecraft. The underlying cause of the incident was a hard-to-detect timing flaw in the spacecraft command sequence that occurred during an operation to prepare for the close flyby. No similar operations are planned for the remainder of the Pluto encounter. New Horizons new images show two very different faces of the mysterious dwarf planet, one with a series of intriguing spots along the equator that are evenly spaced. Each of the spots is about 480 kilometers in diameter, with a surface area (180,956 km2) that’s roughly the size of the state of Missouri = 180,533 km2 or Uruguay = 181,034 km2. New Horizons team members combined black-and-white images of Pluto and Charon from the spacecraft’s Long-Range Reconnaissance Imager (LORRI) with lower-resolution color data from the Ralph instrument to produce these views. We see the planet and its largest moon in approximately true color, that is, the way they would appear if you were riding on the New Horizons spacecraft. About half of Pluto is imaged, which means features shown near the bottom of the dwarf planet are at approximately at the equatorial line. These high-resolution views of Pluto sent by NASA's New Horizons spacecraft include one showing the four mysterious dark spots that have captured the imagination of the world. The Long Range Reconnaissance Imager (LORRI) obtained these three images between July 1-3, 2015. The left image shows, on the right side of the disk, a large bright area on the hemisphere of Pluto that will be seen close-up by New Horizons on July 14, 2015. The three images together show the full extent of a continuous swath of dark terrain that wraps around much of Pluto's equatorial region. The western end of the swath (right image) breaks up into a series of striking dark regularly-spaced spots, each hundreds of miles in size, which were first detected in New Horizons images taken in late June. Intriguing details are beginning to emerge in the bright material north of the dark region, in particular a series of bright and dark patches that are conspicuous just below the center of the disk in the right image. In all three black-and-white views, the apparent jagged bottom edge of Pluto is the result of image processing. The outline globe shows the orientation of Pluto in each image; solid lines mark the equator and the prime meridian (longitude 0°), which is defined as the direction facing Charon. The northern hemisphere is tilted towards the spacecraft. All images have been sharpened using a process called deconvolution. In the early morning hours of July 8, mission scientists received this new view of Pluto — the most detailed yet returned by the Long Range Reconnaissance Imager (LORRI) aboard New Horizons. The image was taken on July 7, when the spacecraft was just under 5 million miles (8 million kilometers) from Pluto, and is the first to be received since the July 4 anomaly that sent the spacecraft into safe mode. This view is centered roughly on the area that will be seen close-up during New Horizons’ July 14 closest approach. This side of Pluto is dominated by three broad regions of varying brightness. Most prominent are an elongated dark feature at the equator, informally known as “the whale,” and a large heart-shaped bright area measuring some 1,200 miles (2,000 kilometers) across on the right. Above those features is a polar region that is intermediate in brightness. 4.8 billion kilometers from Earth and just two and just 800 thousands kilometers from Pluto, NASA's New Horizons spacecraft has taken its best image of four dark spots that continue to captivate. The spots appear on the side of Pluto that always faces its largest moon, Charon — the face that will be invisible to New Horizons when the spacecraft makes its close flyby the morning of July 14. New Horizons principal investigator Alan Stern of the Southwest Research Institute, Boulder, Colorado, describes this image as "the last, best look that anyone will have of Pluto's far side for decades to come." The spots are connected to a dark belt that circles Pluto's equatorial region. What continues to pique the interest of scientists is their similar size and even spacing. "It's weird that they're spaced so regularly," says New Horizons program scientist Curt Niebur at NASA Headquarters in Washington. Jeff Moore of NASA's Ames Research Center, Mountain View, California, is equally intrigued. "We can't tell whether they're plateaus or plains, or whether they're brightness variations on a completely smooth surface." The large dark areas are now estimated to be 480 kilometers across, an area roughly the size of the state of Missouri. In comparison with earlier images, we now see that the dark areas are more complex than they initially appeared, while the boundaries between the dark and bright terrains are irregular and sharply defined. In addition to solving the mystery of the spots, the New Horizons Geology, Geophysics and Imaging team is interested in identifying other surface features such as impact craters, formed when smaller objects struck the dwarf planet. Moore notes, "When we combine images like this of the far side with composition and color data the spacecraft has already acquired but not yet sent to Earth, we expect to be able to read the history of this face of Pluto." When New Horizons makes its closest approach to Pluto in just three days, it will focus on the opposing or "encounter hemisphere" of the dwarf planet. On the morning of July 14, New Horizons will pass about 12,500 kilometers from the face with a large heart-shaped feature that's captured the imagination of people around the world. At 7:49 AM EDT on Tuesday, July 14 New Horizons will zip past Pluto at 13.8 kilometers per second, with a suite of seven science instruments busily gathering data. The mission will complete the initial reconnaissance of the solar system with the first-ever look at the icy dwarf planet. Follow the path of the spacecraft in coming days in real time with a visualization of the actual trajectory data, using NASA's online Eyes on Pluto. In the northwestern region of Pluto's Sputnik Planum, swirl-shaped patterns of light and dark suggest that a surface layer of exotic ices has flowed around obstacles and into depressions, much like glaciers on Earth. Credit: NASA/Johns Hopkins University Applied Physics Laboratory/Southwest Research Institute. The ices in that region are made of nitrogen, carbon monoxide and methane. In the southernmost region of the heart, adjacent to the dark equatorial region, it appears that ancient, heavily-cratered terrain has been invaded by much newer icy deposits. NH has also captured three distinct layers of haze as high as 130, 80 and about 50 kilometers above Pluto's surface. The hazes detected in this image are a key element in creating the complex hydrocarbon compounds that give Pluto's surface its reddish hue," said Michael Summers, New Horizons co-investigator at George Mason University in Fairfax, Virginia. Explanation: Pluto is more colorful than we can see. Color data and images of our Solar System's most famous dwarf planet, taken by the robotic New Horizons spacecraft during its flyby in July, have been digitally combined to give an enhanced view of this ancient world sporting an unexpectedly young surface. The featured enhanced color image is not only esthetically pretty but scientifically useful, making surface regions of differing chemical composition visually distinct. For example, the light-colored heart-shaped Tombaugh Regio on the lower right is clearly shown here to be divisible into two regions that are geologically different, with the leftmost lobe Sputnik Planum also appearing unusually smooth. New Horizons now continues on beyond Pluto, will continue to beam back more images and data, and will soon be directed to change course so that it can fly past asteroid 2014 MU69 in 2019 January. Pluto — Charon is a completely gravity-locked system, not as in the Earth — Moon system, where Moon only locks its near side to the Earth. 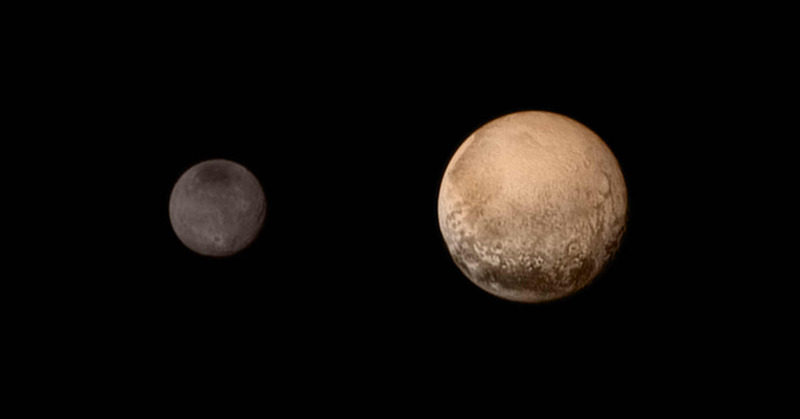 Pluto turns one side to Charon and Charon does it to Pluto. This discloses the gravitational asymmetries of both bodies. The Pluto's Charon-side has more methan ices than Pluto's Charon-far side, which has more carbon monoxide and nitrogen ices. Sputnik Regio (NH photo on the left) includes a polygonal structure typical for a contraction — expanion process, such as de- and re-hydration in mud cracks (of 2:1 phyllosilicates, smectite, montmorillonite), temperature shrinkage in effusive igneous rocks (columnar basalt), thawing - freezing of water ice in permafrost polygonal structure etc.. An alternative explanation by streaming, such as gravitational density streaming known as fluid convection or diapirism (assumed on Triton, Enceladus, Europa and Miranda) does not seem too probable because the Pluto's polygons are edged by troughs, typical for contraction processes. Vertical ruggedness on Pluto and Charon, such as high mountains and deep troughs, are much more stable on these small bodies with negligible gravities (Pluto 0.063 g, Charon 0.025 g) than on the Earth. When I said to my wife, how fascinating it is that New Horizons is 10 days only to reach Pluto area, she could not share my enthusiasm. So I started to explain, that the life on our planet will extinct similarly as it happened many times in the past for small and larger groups of organisms after meteoritic impacts. Unfortunately, if we know it as a probability only, it does not disclose a more specific information about the future event. We must improve our knowledge about meteor sources: the sooner the better, and the more distant the objects are the better, because at great distances, we could easier influence them (there they do not have too strong energy) and the more time has the Earth to prevent the catastrophies). development of projects following and parallel to NH. A great day for New Horizons. The new mission is called the New Horizons KEM, which stands for KB Extended Mission. Asteroid orbit change by Yarkovski effect. Example: The asteroid 6489 Golevka, as measured between 1991 and 2003, drifted 15 kilometers from its predicted position. The program is frequently updated so that it includes the newest discoveries such as those from the DAWN mission and the NEW HORIZONS mission to Pluto and behind. There is another site providing nice views and current data, such as distances, speed, etc. 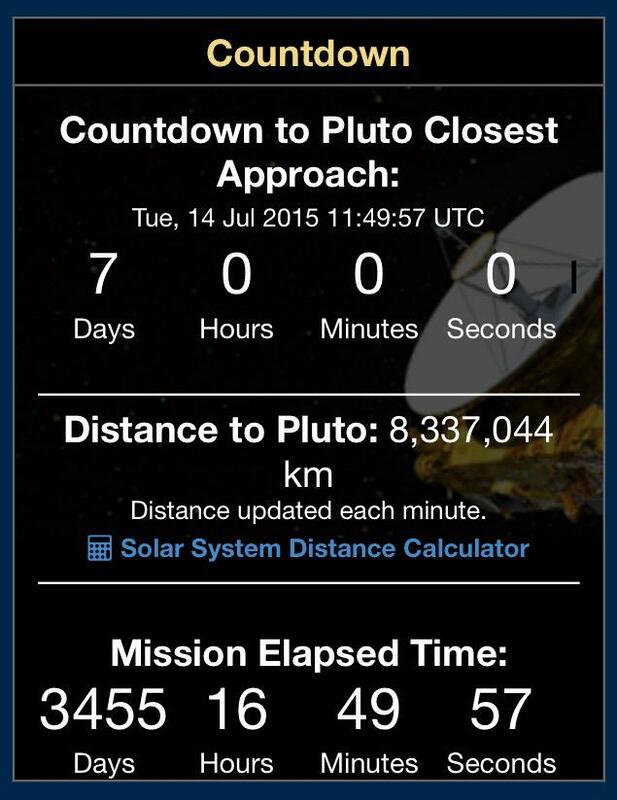 : http://pluto.jhuapl.edu/Mission/Where-is-New-Horizons/index.php . Unfortunately, the above NASA's Eyes visualization programs use unsuitable physical units, not the International Standard of Units (known as SI units - The International System of Units, including the complete metric system). One has to convert the data into suitable units by additional programs, such as the AccelWare's Unit Conversion Tool, http://www.accelware.com/ .